Buy premade caramel sauce, such as Ghirardelli caramel-flavored sauce, or Torani caramel sauce, usually found near the ice cream freezers at the grocery. Heat the butter in a small saucepan until it is melted. Add brown sugar and cook at medium heat until sugar melts. Add vanilla. When the mixture is well combined, remove from heat and add in cream and pinch of salt. Warm until bubbling. (If you are using the premade caramel sauce, heat in the microwave for one minute, or until bubbling.) Mound a pile of washed and drained raspberries on a saucer. Heat raspberries in microwave for thirty seconds. 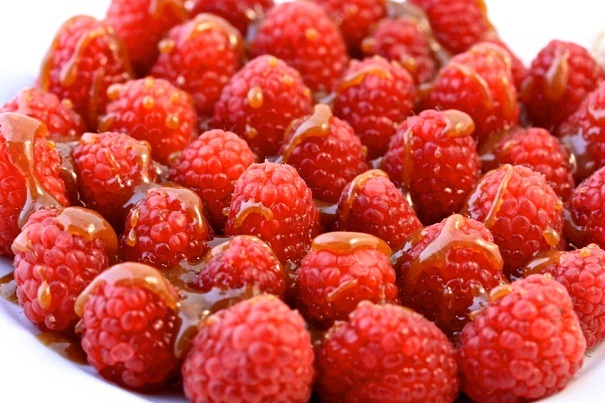 Drizzle the caramel sauce over the raspberries. Heat several store-bought butter cookies in the microwave for 20 seconds. Garnish raspberries with cookie and serve.